If you’ve been living under a rock, PUBG Mobile is a real thing and it is pretty damn awesome on iOS and Android. The team has been updating it with some great features and new content on a regular basis. Hot on the heels of the big 0.5.0 update, PUBG Mobile (Free) hits a big milestone on mobile. Tencent and PUBG Corp. have revealed that the game is now at 10 million daily active users worldwide. This does not include China as the release on iOS and Android is different in China. This milestone is less than 2 months after the game debuted worldwide. 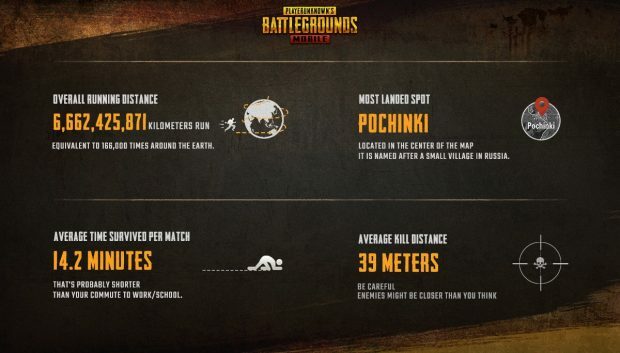 The developers have released an infographic about the game with various stats that you can view above. I’m curious to see how the team continues to add content to the game. They will be working on big updates each month and the most chocking thing to me is how much more polished PUBG feels on iOS compared to the Game Preview release on Xbox One. The newest update added Miramar and a whole lot more. Now is a great time to get back into PUBG Mobile as well. You can now party up quickly with local players and have access to the new map. Make sure to join our Discord if you still play it here.